Last updated at 2:01 p.m. PT. 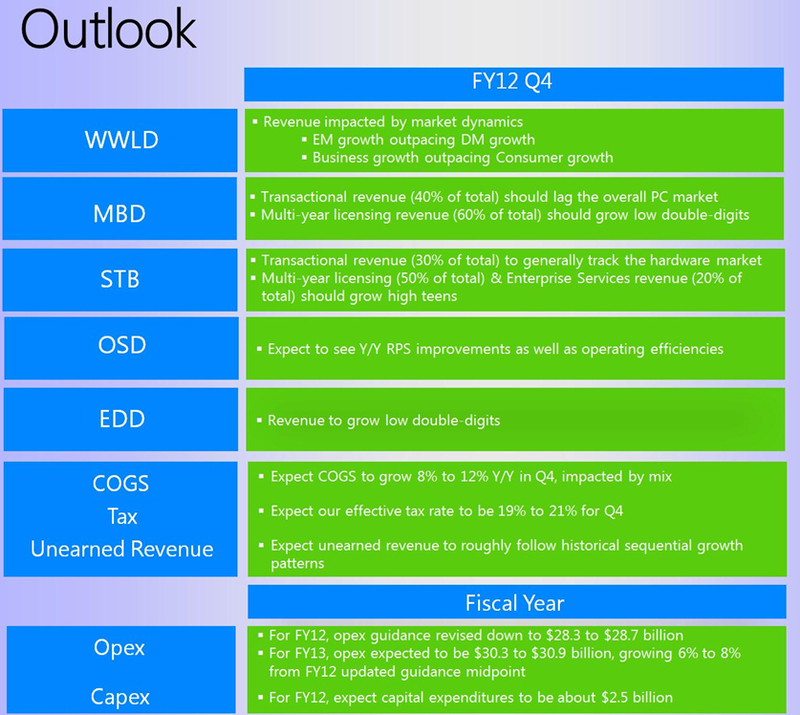 Microsoft delivered a strong fiscal third quarter as the software company's enterprise lineup -- SQL Server, System Center and products like Lync and Dynamics CRM -- carried the team. The company reported third-quarter earnings of $5.11 billion, or 60 cents a share, on revenue of $17.41 billion. 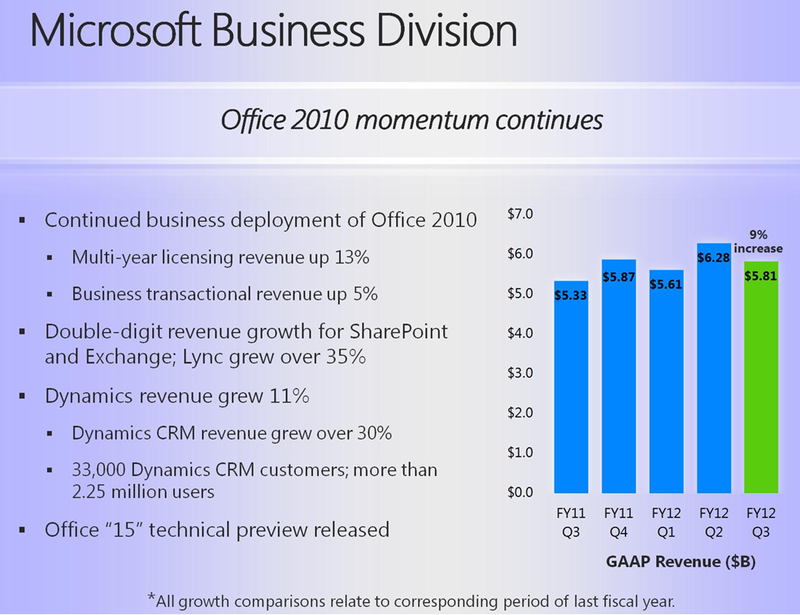 Overall, the quarter played out about the way analysts projected -- Microsoft's business tools carried the quarter. Microsoft's server and tools unit saw revenue jump 14 percent from a year ago to $4.57 billion. 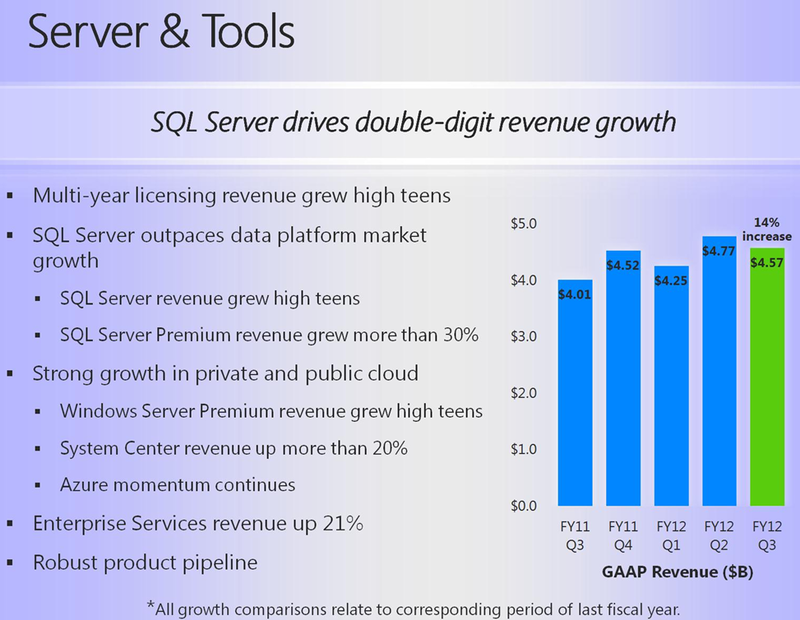 SQL Server revenue was up double digits and System Center sales surged 20 percent. Operating income for the servers and tools unit was $1.74 billion. Microsoft's business division delivered third-quarter revenue of $5.81 billion, up 9 percent from a year ago. Office upgrades continue and Dynamics revenue jumped 11 percent. Operating income for the business division was $3.77 billion. 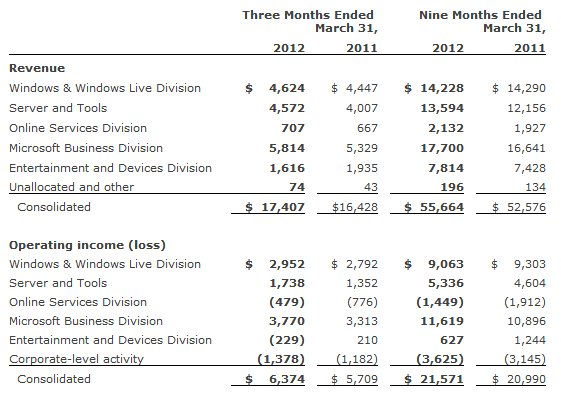 As expected, Microsoft's online unit continues to lose money, but the software giant cut its losses. For instance, the online unit lost $479 million in the third quarter on revenue of $707 million. That's still a big chunk of change, but an improvement on the $776 million lost in the third quarter a year ago. The entertainment and device division reported a third-quarter operating loss of $229 million on revenue $1.61 billion. Xbox remains the top gaming console. This story originally appeared at ZDNet's Between the Lines under the headline "Enterprise carries Microsoft until Windows 8 launch; Q3 strong."